When it announced the iPhone X, Apple pushed the expectations (and price tags) for flagships phones higher than they’ve ever been before. Now, Google gets a chance to hit back with its own homegrown handsets that will not only show how Google has matured as a hardware maker, but also what’s coming soon on Android Oreo. And with a full year of experience and development (including a bunch of new IP and personnel) under its belt, Google really can’t afford to mess up its second-generation of Pixels. 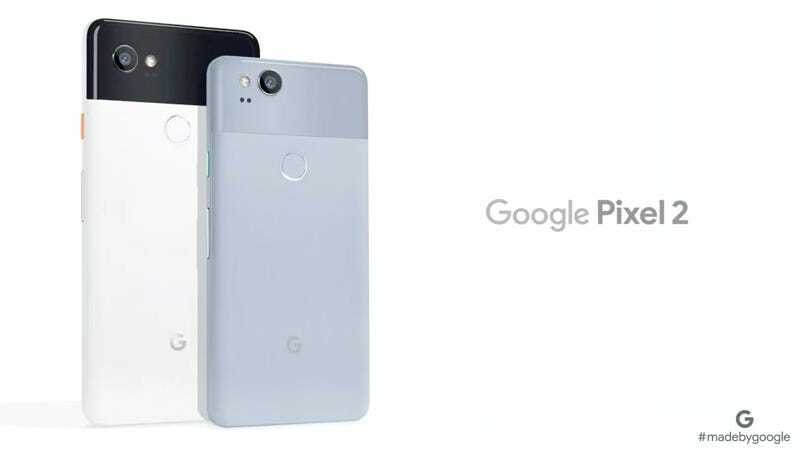 Like last year, Google is launching two phones for 2017, with the smaller Pixel 2 featuring a 5-inch full HD AMOLED screen and the larger Pixel 2 XL sporting a full 6-inch POLED QHD+ display. Both phones will include the latest version of Android Oreo out of the box, along with Qualcomm’s Snapdragon 835 processor, 4GB of RAM, and your choice of 64GB or 128GB of storage. Unfortunately, one thing you won’t be getting is a headphone jack, as both the Pixel 2 and Pixel 2 XL only have a single USB-C port down bottom (though Google does include a USB-C to 3.5mm dongle in the box). The black and white color scheme will only be available on the Pixel 2 XL. This one is a biggie, because one of the most maligned aspects of the original Pixels was their design. But it seems Google can’t quite let the old designs die, because the company is steadfastly sticking to what is becoming the Pixel’s signature two-toned look. On back, the top third of phones features a shiny glass panel that encompasses the rear camera, while the bottom two-thirds is constructed from matte aluminum and holds the rear fingerprint reader. That said, this time around there seems to have been a lot more attention paid to the way things fit together, with both phones sporting a curvier, more streamlined style, in addition to new color options ranging from “Kinda Blue” to my new favorite black and white Panda-like colorway on the Pixel 2 XL. On front, the big bezels on the original Pixel XL have been reduced significantly, giving the Pixel 2 XL a more modern facade befitting a phone in 2017. Both Pixel 2's will sport POLED screens for bright colors and darker blacks, smaller bezels and a new 18:9 extra widescreen aspect ratio. The Pixel 2's revamped appearance ain’t all, as both big and small phones have gotten some crucial new features in the form of IP-67 water-resistance (good down to 5 feet deep for 30 minutes), Bluetooth 5.0 and new dual front-facing speakers. For fans of the old Nexus 6P, those speakers harken back to a time when good smartphone audio was still a big deal, especially in light of all the mono-speaker phones like the Galaxy S8. Both Pixel 2 phones will also come with OLED displays, with the larger Pixel 2 XL also getting a new extra-widescreen 18:9 aspect ratio and a built-in polarizer that’ll let you still see your phone clearly while wearing sunglasses. And because OLED displays don’t use any power when displaying black, Google has added a new always-on display to the new Pixels too. Google has also brought the pressure-sensitive feature seen on the HTC U11 over the Pixel 2, so now you can simply squeeze the sides of the phone to quickly access the Google Assistant. And of course, it wouldn’t be a Pixel without talking about the camera. Both the Pixel 2 and Pixel 2 XL will support a single 12-megapixel camera in back which combines an f/1.8 aperture lens with optical image stabilization and some clever software enhancement to deliver what the people at DxO claim is the highest quality smartphone camera ever made. There’s also a new portrait mode that will let you capture pics with super shallow depth of field similar to what you’d get on a big DSLR or mirrorless camera. In addition to new features on the outside, the Pixel 2 and Pixel 2 XL are also getting some new tricks on the inside thanks a new Google’s Android update, which features a revamped home screen layout for stock Android. Instead of having your traditional quick launch icons on the very bottom the home screen, the first thing you’ll see is a new Google search bar, with the quick launch icons above that followed by the carrot-shaped Pixel Launcher on top. That should make it easier to get to your searches faster, while also making the previous “pill” widget expendable. Google is also bringing a new AR strikers feature exclusively to the Pixel phones that will let you use Google’s ARCore platform to add virtual objects into your camera’s view. AR stickers will feature characters from franchises like Stranger Things, the NBA and more. The other new Pixel-exclusive feature is the new google Lens feature which will let you identify objects just by pointing your camera at them. The Pixel 2 starts at $650, while the Pixel 2 XL starts at $850. Phones will be available unlocked from Google and online retailers like Best Buy, and from Verizon on the carrier side. Pre-orders start today, and if you’re lucky, Google is going to toss in a free Google Home Mini. However we’re still waiting on an official release date.